What do I do if I am injured at work in North Carolina? 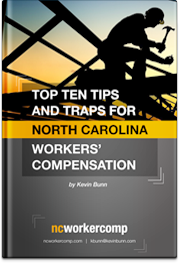 INFORMATION ON WHAT TO DO IF YOU ARE INJURED AT WORK IN NORTH CAROLINA FROM RALEIGH AREA WORKERS’ COMPENSATION ATTORNEY KEVIN BUNN. Most workers will sustain some form of injury while on the job. If you are injured at work in North Carolina it is important to take a few sensible steps to avoid losing important rights under NC workers’ compensation law and to protect yourself from being responsible for medical expenses. Make a note of any witnesses to the accident, especially if they are not people you know. Get the name and address of any bystanders who may have seen the accident. If appropriate take pictures of the place you were injured. Be sure any relevant evidence is secured. Immediately notify your employer of your accident and your injury in writing, and file your claim with the North Carolina Industrial Commission. It is best for an injured worker to file a Form 18 with the NC Industrial Commission within thirty days of the accident. The worker should provide a copy to the employer. At a minimum an injured employee should provide written notice to the employer stating when and how the injury occurred. Be aware that not all on-the-job injuries are covered by workers’ compensation. Take care in how you describe the accident. Get the medical treatment you need. Hopefully your employer’s workers compensation insurance company will provide medical treatment as required by NC workers’ comp law. If not, use your health insurance. Be clear with your doctor about how you were injured. Follow all of your doctor’s instructions. Be sure to get any physical or work restrictions IN WRITING EVERY TIME YOU GO TO THE DOCTOR. Give your employer a copy of any work restrictions and see if they will be able to accommodate them. Talk to a North Carolina workers’ compensation attorney. If you have serious injuries, are out of work for a significant period of time, are not receiving timely communications from your employer or their workers’ compensation carrier, or if your claim is denied, you should speak with a NC workers’ comp lawyer. An experienced NC workers’ compensation lawyer can help you understand your rights.